Besides being fun to race and, at times, annoying to deal with, Metro buses have one other noteworthy quality for cyclists. You can take your bike on them at any time, on any line. You can carry folded bikes on board or place bikes (except tandems or other odd-shaped bikes) on the racks on front. Sadly the same is not true of all other transit systems. Several bus systems are without racks. Most trains don't allow normal bike access (everyone allows folding bikes - though some require that it be in a carrying case). These system should re-evaluate their policies and equipment to allow for more bicycle access during more of the day. Every bus system should have racks. In fact, Congress should mandate that transit buses sold in the U.S. come equipped with racks. Trains should make more allowances for bikes, including expanding hours and providing hooks or set aside space. Future transit systems, such as the new light rail lines, should include space for bikes. Here are all the local transit systems I could find ranked first to worst (in my opinion). Fairfax Connector - No information on their policy available, but pictures don't show racks. Update: They now provide bike racks and can be considered Good. Metro Rail - Blanket rule forbidding non-folding bikes for 6 hours a day(rush hour) - no exceptions. Amtrak - Some lines allow for bikes, but the service "varies widely from train to train, and station to station" and you have to call to find out if you're OK. They charge a fee, which isn't constant and don't allow for unusual sized bikes. They do allow folding bikes. I feel like Amtrak could make some money running bike cars to Harper's Ferry, Cumberland and Pittsburgh on Friday evenings (and back from Harper's Ferry and Cumberland on Sundays) allowing cyclists to ride one way on the C&O and Allegheny Highlands trails, but I'm not sure if that train has space for bikes. UM Shuttle buses - No information on their policy available, but this site seems to indicate that there are no bicycle racks Update: UM Shuttle buses are being equipped with bike racks but not all of them are yet. Update: Potomac and Rappahannock Transportation Commission (PRTC) - "Bike racks have been installed on 40 PRTC buses that serve the OmniLink local routes, the Cross County Connector route and the Metro Direct routes that connect to nearby Metro stations. At this time, PRTC does not anticipate installing bike racks on OmniRide commuter buses." VRE - Full size bicycles cannot be accommodated on VRE trains. Collapsible bicycles, however, are permitted on all of our trains. Bikes will be boarded and removed last—after all pedestrian passengers have boarded or detrained. Update: As of May 2009, Bicycles are allowed on the last three northbound trains, the midday and the last three southbound trains of the day. VRE is limiting bikes to two per train car and says they must be tethered to train seats. MARC - Collapsible bikes only. George (Falls Church) - No information on their policy available. Defunct. You are welcome to take your bicycle on MTA Light Rail and Metro Subway trains. 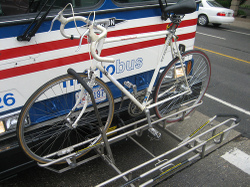 All MTA buses are not presently equipped with racks; however bike racks are now available on selected routes. If the train is crowded due to evening or morning rush hour, sporting events, or special events, please wait for the next train. As near as I could find, no one has been injured by a bike on MTA light rail or Subway. Addendum: According to several comments, UM Shuttle buses are being equipped with bike racks but not all of them are yet. So we'll upgrade it to "Bad" until it reaches 100%. I seem to recall seeing bike racks on University of Maryland Shuttle buses. I don't think I have any photos in my Flickr account (I am only a few thousand photos behind in uploading) but I'll check tomorrow. I know how time consuming it can be to look up bicycle regulations for mass transit agencies so thanks for going to the trouble and posting the details on WashCycle. 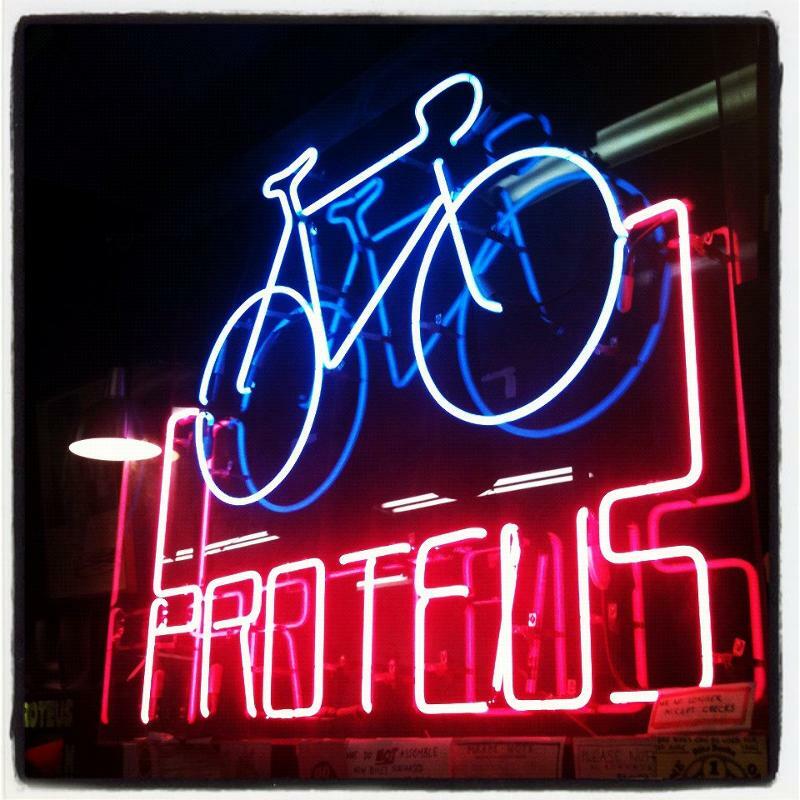 I've just added a post about the story on RideTHISbike.com. By the way, I have links & info regarding the policies at some other transit agencies on my site. Due to the number of posts, the best way to find them is to visit my site and enter mass transit into the search box. 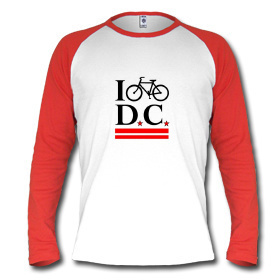 Urging bicycling for recreation, commuting, health and a better future. The cover page of UM's annual report shows a picture of the new-style commuter bus with rack. In the report, UM transportation services claims that "bicycle racks were installed on the front of off-campus commuter buses". They don't use the keyword "all", and "off-campus" likely excludes the "color" shuttles that stay on campus. For some reason, they decide to consume one of the two bike spaces on the Metro shuttle route for six weeks with a (imho, ugly) bike they raffle off to promote cycling. I wish they'd teach undergrads to inflate their tires and raise their seats instead. UMD shuttle buses are being equipped with bike racks now. Each new bus has a rack, but they are not retrofitting at all, so it might be a while before all the buses have them. Based on personal observation, I'd put it at about 75% or so. Not all of the commuter routes have them, yet, though. BTW, the raffle's over. Metrobus and Mont Co Ride-On aspire to 100% bike racks, but I've encountered appx 4 Metrobuses and 5 Ride-Ons without bike racks. And the drivers would not let me board with my bike. In 2 cases, they were the last buses of the day from those stops, so I wound up biking all the way home in the cold after waiting a half-hour for each. So now, as a daily long-distance bike commuter, I attempt to bike-n-bus only if absolutely necessary.